Downtown Silver Spring is a dynamic retail, dining and entertainment development that prides itself on creating an experience that reflects the vibrant surrounding community. The urban development is at the center of a thriving commercial business district. The goal was to leverage the large population of people working in the area – either in an office or at home – to Downtown Silver Spring during business hours to enjoy an outdoor environment with accessible dining and shopping. Delucchi Plus helped Downtown Silver Spring and its management company Peterson Companies cultivate its ‘Get Out of the Office’ campaign, positioning Downtown Silver spring as the natural destination for lunch and happy hour, office parties, and after-work programming, through social media content and advertising, public relations, and strategic media placements. We wanted to take it one step further though – we pitched Peterson Companies to create an outdoor workspace that offers people the opportunity to literally work outside and enjoy the weather in an environment uniquely designed to accommodate the workplace need for collaboration spaces, individual workstations and high-speed Internet. Thereby allowing office and/or telecommuting employees an ideal place to gather, enjoy lunch and do some shopping while they are there. To make this vision a reality, Peterson Companies and Downtown Silver Spring partnered with Montgomery College, where Architectural Technology students formed teams and competed in a semester-long project to make this seed of an idea come to life. Peterson Companies recognized the amazing talent at the local community college and challenged the students to create a space that reflected the Silver Spring neighborhood, took advantage of the onsite amenities and could be set up and removed by the onsite team on a daily basis. The students were motivated by the knowledge that the winning design would actually be built at Downtown Silver Spring – a game-changing accomplishment for a second-year architecture student’s portfolio. 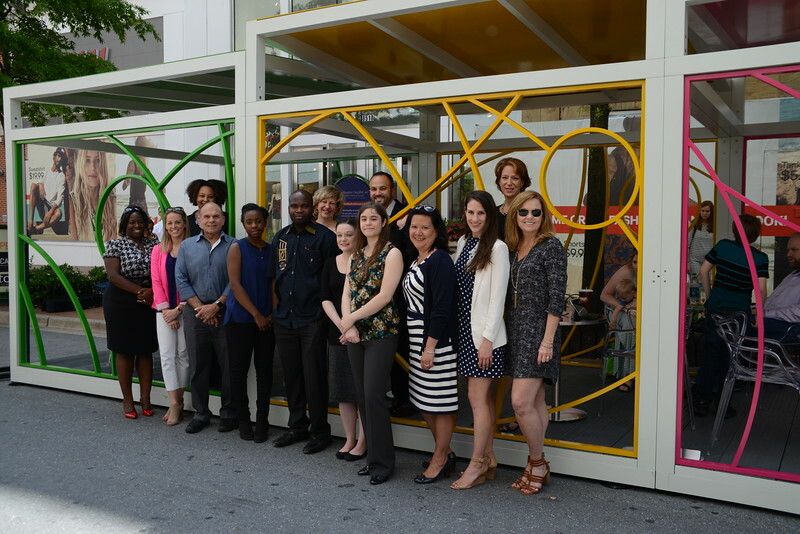 On June 6, Peterson Companies and Downtown Silver Spring debuted OUTBOX; standing at 40 feet long and 10 feet tall, OUTBOX features a colorful modern design, free WiFi and electrical outlets where users can charge their phones and laptops. Delucchi Plus helped support this launch by conceptualizing the name of the workspace, creative branding and public relations. We interviewed the winning student team, as well as a representative from Peterson Companies to create an engaging and informative video to pitch to media, which ultimately resulted in LIVE TV segments on WJLA Good Morning Washington, WUSA9 Great Day Washington as well as coverage from local outlets including WTOP, The Washington Post, Washingtonian, Bisnow, Bethesda Beat and more. Watch our work below, and next time you’re feeling a little cramped in your cubicle, get out of the office and take a field trip to OUTBOX! The Story Behind OUTBOX at Downtown Silver Spring from Delucchi Plus on Vimeo.